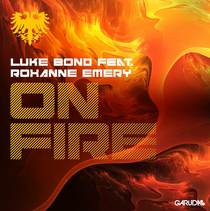 Luke Bond and singer-songwriter Roxanne Emery (sister to Garuda label chief Gareth Emery), get heavy in the new music video for their collaboration 'On Fire,' which Gareth has pronounced "the biggest track in my sets this year." With a mixture of melodic trance and emotional highs and lows, 'On Fire' works just as well on the dancefloor as it does at home. It’s already gained neary 180,000 views in just a few days. Luke Bond burst onto the scene in 2012 with 'The Other Side', and having scored ASOT tune of the week, Luke has since released various tracks which has led to support from DJs including Gareth Emery, Armin van Buuren, Paul van Dyk, Nicky Romero, Dash Berlin, W&W, Max Graham and Darude. Roxanne Emery is a London based singer-songwriter, multi-instrumentalist and producer. She has released three independent EPs since 2011 and her music has been featured in episodes of several popular television shows, including Cougar Town, Awkward, and Keeping Up with the Kardashians. She also runs her own label, LATE Records, which manages other independent artists. Her album 'For Weddings And A Funeral" will be released this year. ‘On Fire’ is out on Beatport on January 13th, all other stores on January 27th.